The Revise for Success Series provides you with all you need to inspire students to revise in interesting, active and engaging ways. 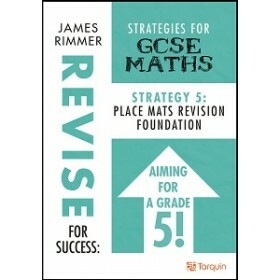 Used as lesson starters, homework tasks or as part of a structured revision session, each A4-size activity sheet will successfully challenge pupils learning on each of the main key strands of the new Mathematics GCSE curriculum focusing on the key skills of fluency, reasoning and problem solving. Executed skilfully, each activity can successfully engage, excite and energise students on a daily basis or in the run up to that all-important exam. Designed with busy teachers in mind, the activities are ready-to-go and come with all the answers included. These resources not only perfectly meet the needs of the modern mathematics teacher, but also those of the dedicated and supportive parent at home. Packed with visual appeal, these activities will enthuse even the most reluctant pupils, and convince them once and for all, that revision can be enjoyable, rewarding and fun. James Rimmer is a mathematics teacher in the North West. His innovative approaches to mathematics revision have kept thousands of students fresh and excited, whilst at the same time being as easy for teachers to implement as they can possibly be. PRICE INCLUDES Electronic Materials: each book includes a voucher that can be redeemed against either materials from Tarquin Select or if you prefer, to get a printable version of this title. Redemption details are provided with the book.